Please call your Oklahoma City plumbing professionals at Pipes Plus Plumbing (405) 942-7473 with any addiotnal questions you may have after reading the following information. Tankless water heaters are a relatively new way to provide domestic hot water to a home. Sometimes called on-demand or continuous water heaters, tankless units are designed to deliver hot water when, and only when, it is called for. According to the Propane Education and Research Council, tankless water heaters, especially those fueled by propane, save energy and water and emit fewer green house gases than conventional storage type electric water heaters. Of course savings vary by household use, local utility rates and other factors. Still many contractors aren’t sure how tankless water heaters work and might be a little skeptical about their performance claims. To answer those questions, let’s take a look at how a tankless heater compared to a storage water heater by looking at the guts of both products. 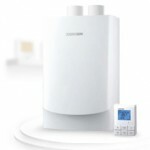 Let’s look at conventional water heaters first. Residential storage type water heaters use an insulated tank, usually about 40 gallons in capacity. The water in the tank is kept heated at all times for delivery, so the unit is always on and using energy, albeit at a very slow rate to maintain water temperature within about 10ø of the unit’s thermostat settings. A main water supply enters from the top of the tank; a dip tube extends that line to the lower section of the tank. When hot water is called for inside the house, the water in the tank begins to flow through the homes plumbing system through a second pipe at the top of the tank. A separate chamber below the main tank contains the units heating element which is controlled by a thermostat, or for natural gas and propane units, a burner control. As the hot water in the tank is exhausted, the burner below ignites to heat incoming fresh water. Little or no hot water is available during this recovery time. 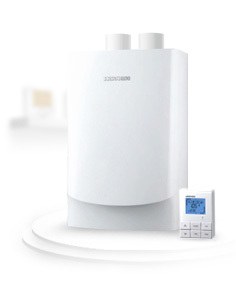 Storage water heaters provide a relatively low installed cost, a variety of sizes to serve large and small homes, and respectable flow rates to deliver a domestic hot water. Because of its size, however, the storage water heater is usually located in a home?s utility closet or garage not always as centralized location within the homes floor plan. As a result, delivering hot water throughout the home can take a few minutes, a condition called lag time that all water heaters experience to some degree. This lag time though wastes several gallons of unused water and can be inconvenient for the owners. Now let’s take a look inside a tank less water heater. These units use a compact metal cabinet instead of a tank. Because there is no preheated or standby water to manage, there’s no need to insulate the cabinet to maintain a level of heat or heating energy. So instead of being always on, a propane tankless unit only uses energy when there is a demand for hot water. Otherwise it is effectively off. That difference accounts for the bulk of the energy savings and reduced emissions of afforded by tankless water heaters. When hot water is called for by an appliance or a faucet, cold supply water flows into and through the unit. A sensor detects the flow triggering a computers generated signal to send propane to the heating element and bring combustion air into the inducer motor. This exterior unit draws combustion air from the intake at the top, and exhausted from the louvered vent near the bottom. Units installed inside require a sealed combustion direct vent pipe that both brings in and exhaust combustion air safely from and to the outside. The flow of propane triggers the burners to ignite, warming the heat exchanger. These pipes curl around and through the exchanger, heating the water as it flows. The heated water is then delivered through the homes plumbing system to the appliance or faucet being used. This process enables a tan less water heater to deliver an almost unlimited amount of hot water, even if one hot water using appliance or fixture is on at a time. And once the tap is turned off, so does the unit and its energy demand and related energy costs. The space efficient design of tankless heaters enables them to be placed strategically throughout the house and even outside to greatly reduce lag time and the amount of water wasted in that process. Before we conclude this insider’s view into domestic water heating, here are a few quick tips for choosing and installing a electric, natural gas or propane fueled tankless water heater. Size the unit for the homes specific hot water needs. Provide adequate capacity for the water supply and delivery network. Over sizing a unit actually works against the advantages of a tank less water heater, if the home has a lots of needs consider multiple units and dedicated plumbing to ensure their performance. Installation is relatively simple, similar to a storage heater and should be performed by a professional plumbing contractor. The water supply line typically connects to the bottom of the tank as does the delivery, or outgoing line. On this exterior unit, the dedicated line for propane also connects at the bottom of the cabinet. The unit also requires electricity and control wiring to operate its electronic components. For any type of water heater, it also is a good idea to treat any water source that mineral rich or of poor quality. Doing so extends the life and performance of the unit. The Propane Education and Research Council video below will provide you with greater insight and assurances about tankless water heaters. Tankless water heaters are an increasingly viable option for homeowners to help distinguish their homes as efficient and convenient. They save money, energy and water while helping reduce harmful greenhouse gas emissions. Tankless water heaters also deliver greater convenience and comfort and can be a key element in securing a home sale or remodeling contract. We encourage you to check out the efficiency ratings now available among leading brands of tank less water heaters by the Federal Energy Star program. Also investigate federal, state and local utility tax credits, rebates and other financial incentives available to homeowners who specify tankless units for their new and remodeled homes. More information about tankless water heaters and the benefits of using propane to create more comfortable homes from the inside out, please go to the Propane Education and Research Council. Pipes Plus Plumbing at (405) 942-7473 is ready to answer any of your questions about conventional or tankless hot water heaters and to provide licensed, bonded and insured plumbers to estimate or install a new system for you in the Oklahoma City metro area.